Marchionne: "I am tired. I want to do something else." DETROIT -- Fiat Chrysler Automobiles CEO Sergio Marchionne said the automaker can double profit within five years by exploiting the potential of the Jeep brand. With the offroad nameplate in position to grab as much as 20 percent of the global SUV market and coffers padded by lower U.S. taxes, it will be his successor who carries out the strategy. Marchionne, who is one of the longest-serving bosses in the auto industry, was steadfast in his commitment to retire from Fiat in early 2019 after 15 years, succeeded by one of his lieutenants, he said in an exclusive sit-down interview. Marchionne has transformed Fiat from a near-bankrupt European manufacturer into a global automaker with the 2014 merger with Chrysler, giving the group brands including Jeep, Alfa Romeo and Maserati. While small compared with Volkswagen and Toyota, Marchionne has given Fiat a new lease on life by streamlining expenses and shifting from unfashionable sedans to higher margin SUVs. His growth strategy is focused on a global expansion of Jeep. "There is nothing which can tell me that Jeep could not own one in five SUVs," equivalent to about 5 million deliveries a year, Marchionne said. "If that's true, the upside for FCA -- we are just beginning to skim the surface." If Jeep can reach these targets, it would mean "the profitability of this house is going to be multiples on what it makes now" and doubling profit by 2022 is "possible," he said. President Donald Trump’s tax cuts could further boost profit by about $1 billion a year, he added. The automaker targets at least 7 billion euros ($8.5 billion) in adjusted earnings before interest and taxes in 2017. Marchionne’s successor will have to live up to these expectations in a rapidly changing auto industry that risks diluting the edge of traditional automakers. He says there’s an evolving list of internal candidates under review. All of these executives are working on Fiat’s strategic plan through 2022, and one of them will end up being “the top dog,” he said, adding that he has no indication the company would look to make an external hire. CFO Richard Palmer is seen by investors as the leading candidate for the job. Jeep chief Mike Manley and Alfredo Altavilla, who returned Fiat’s embattled European operations to profit, are seen as Palmer’s main contenders. While Marchionne declined to identify any people on the short list, he said it included potential candidates reported about in the press as well as someone else, who is not in the media’s spotlight. 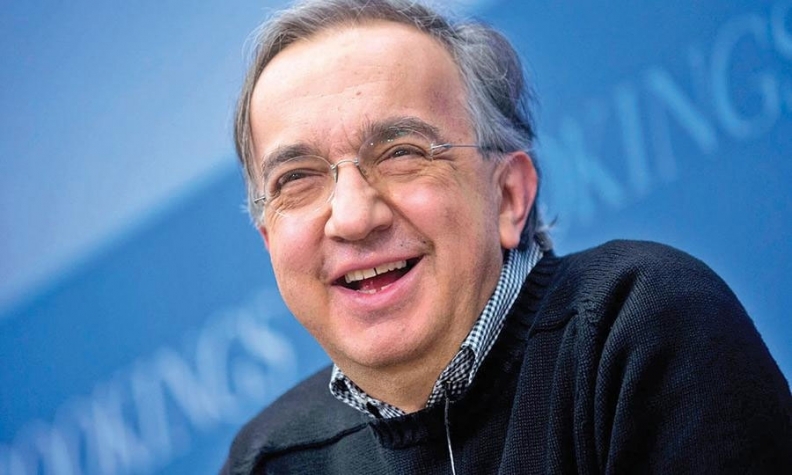 FCA's new five-year strategy will be presented June 1, the same day he was hired as CEO in 2004 in the dramatic hours after Umberto Agnelli passed away. John Elkann, the young heir of the Italian billionaire family, was looking for new leadership at Fiat and made a gamble on Marchionne, at the time CEO of testing company SGS and with no experience in the auto industry. The move paid off. Fiat’s value has climbed to 29.5 billion euros ($36 billion) after soaring 28 percent in the first two weeks of 2018. The iconoclastic executive, who favors black sweaters over suits and ties, plans to leave FCA after erasing debt, accumulating at least 4 billion euros of net cash and boosting adjusted net profit to about 5 billion euros. “I don’t know a reason not to confirm 2017 guidance and 2018 targets,” the Fiat CEO said. The CEO is open to staying connected with the company through a role at the billionaire Agnelli family’s Exor, Fiat Chrysler’s dominant shareholder and the main beneficiary of Marchionne’s wheeling and dealing, which also saw the spinoffs of Ferrari NV and CNH Industrial. During his tenure, he increased the former conglomerate’s value by more than 10 times to about $80 billion. Still, the challenges for Fiat and other mass-market automakers will intensify in the coming years amid a shift to an era of self-driving electric cars. For now, Fiat is planning to tackle the disruption on its own. After Marchionne’s push to merge with General Motors fizzled, an alternative isn’t around the corner amid a lack of interest from potential partners, according to the executive. “If nobody wants you, then celibacy may be the only option,” said Marchionne. “I adjusted to the notion of celibacy,” and sees Fiat now in stronger position after GM spurned his approach.